21.02.1985, 1.500 Ordinary Shares of £ 0.0.25, #6181, 20,2 x 22,4 cm, schwarz, weiß, Knickfalten. 21 February 1985, 1,500 Ordinary Shares of £ 0.0.25, #6181, 20.2 x 22.4 cm, black, white, folds. Die Firma investierte in Japan, Australien, Malaysia, Hong Kong, Singapur, Südkorea und Taiwan. Größter Aktionär war J. Rothschild Holdings. The company invested in Japan, Australia, Malaysia, Hong Kong, Singapore, South Korea and Taiwan. 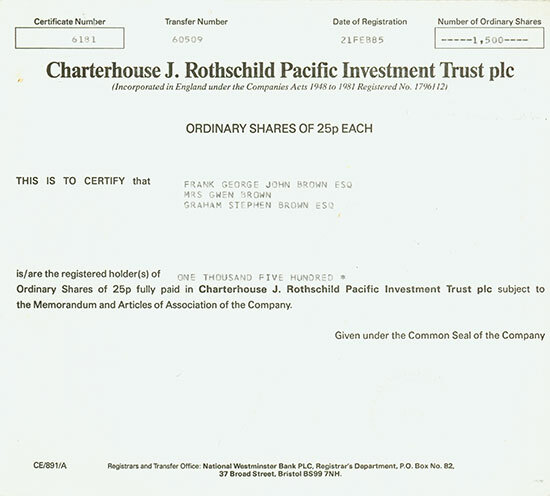 Its major shareholder was J. Rothschild Holdings.